Happy Valentines Day to you all 🙂 We just had a girls day here. My mom is visiting for a bit while the hubby is out to sea, so it’s been fun. We had beautiful weather, a wonderful church service, a yummy lunch, and some fabulous shopping! I even had time to rake the front yard and fix up the flower bed a bit. I say that’s my workout for the day! Whew! 1. Place the piece of fleece right side up. 2. 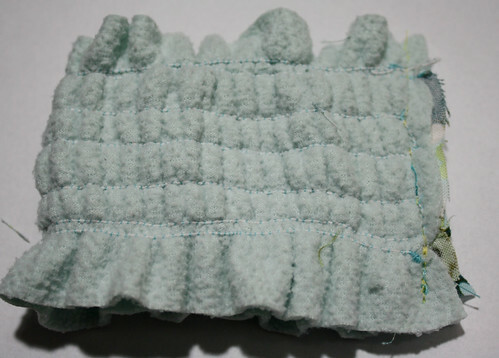 Place the piece of fabric on top middle of it right side up, matching up the sides. Pin in place. 3. 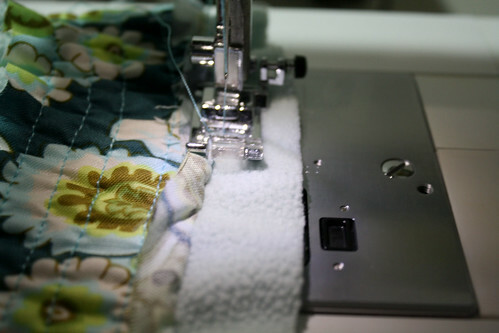 Put elastic thread on your bobbin for shirring and shirr the two layers for a couple of rows. I did quite a few. 4. Then push the fabric top down and shirr underneath of it at the top and bottom. 5. Place the two short ends together, right sides facing, and pin. Sew that side together. All done. Now it’s ready to adorn some one’s soda can. This is so cute!! 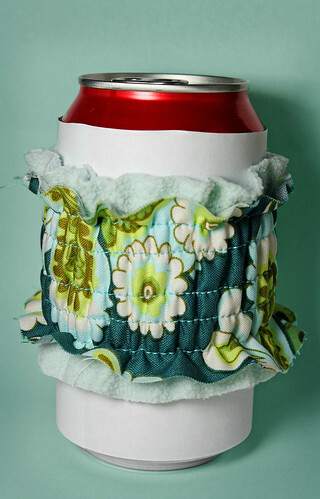 It’s like a garter for your coke!! adorable…like little bathrobes for your coke! Very cute! I’ve been thinking about trying shirring because my shop has a couple of cute girl’s patterns that have a shirred bodice. This is a great intro project so I don’t “waste” the elastic thread. Yippee!! That’s super cute! Thanks so much for adding this to the One Pretty Thing Flickr pool. I’ll b elinking in tomorrow’s Daily DIY.